Raymond is fourth in a family of eight children and was born and raised in Alexandria, Louisiana. Nancy is third in a family of eight children who lived at numerous Air Force Bases and settled in Tulsa for her Junior High and High School years. 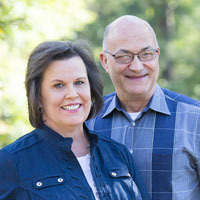 Raymond and Nancy met in Tulsa Oklahoma when he attended college. They married in 1973 moved to Plano, Texas where their sons Raymond III and Matthew were born. While in Plano they attended 18&P Church of Christ. In 1980 they moved to Spring with work and attended Champions Church of Christ. They moved to the Conroe area on 1488 in 1987 and attended Magnolia Church of Christ for 23 years. Since 2000, Raymond, Nancy and Matthew work and worship with the Woodland Oaks Church of Christ. Raymond works in Information Technology as a system engineer dealing with projects and problem resolution for servers and networks.